Food in the 1950s was a lot plainer than we are now used to. For a start, wartime rationing didn’t finally end until 1954, so various kinds of food, meat, sugar, sweets and so on, were not fully available before then. Also, there was no food industry as we now know it, ready made food was unknown, so everything was home prepared and cooked, no convenience food to speak of. The lack of domestic refrigerators meant that food had to be consumed soon after purchase, so stocking up on ready made food to reduce future shopping trips just wasn’t on. And although fish fingers made an appearance in the mid-1950s, there was less point in buying them if they had to be consumed as soon as you got them home. So home preparation and cooking was the norm, and was healthier than buying factory produced, but was certainly a lot more labour intensive. Many more women were stay at home housewives, which made this system possible, but at present, when in the majority of households both partners work outside the home, this would not be possible. The highlight meal of the week for us was the Sunday roast, beef, pork or lamb, with a very occasional chicken. Chicken was a luxury, sometimes an alternative to turkey at Christmas, but ordinarily too expensive for every week. Factory farming of chicken had not got underway, and old fashioned field farming of them was unproductive, meaning that they were expensive. One of our oddities at home (at least I think it was odd) was that with roast beef, we would eat the Yorkshire pudding as a dessert, sprinkled with sugar. It wasn’t until I started to eat beef away from home that I learned that we were unusual. A substitute for chicken was rabbit, and we ate this quite frequently, if not once a week, then not far off. Normally as a rabbit stew. It’s has a very good flavour, a dry meat not unlike chicken in texture, and a stronger flavour. The market for rabbit was killed off by myxomatosis which was rife in the late fifties, and I suppose eventually the factory farming of chicken did for it-I’m not sure factory farming rabbits would have been successful. But then in the early fifties, I probably would have trouble believing in factory farmed chicken. Now that rabbits are myxomatosis resistant we should perhaps reintroduce them to the menu. Of necessity we ate cheaper cuts of meat; liver, kidney, ribs, and so on. And enjoyed them. Having grown up in the war, we were used to all cuts and glad to be eating well. We also ate a lot of tripe. There were lots of UCP shops in Manchester. UCP was United Cattle Products, and they sold tripe, cowheels, pigs’ trotters and similar stuff from cattle and pigs. 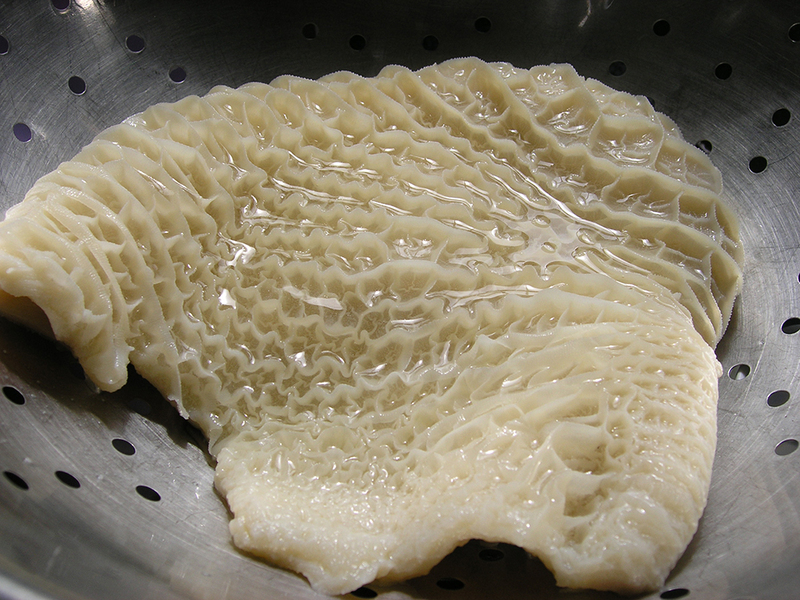 My mother worked for a time at UCP, but even before, we used to eat tripe often, cold, with salt and vinegar, never cooked like the French do. I wouldn’t say that I enjoyed it particularly, but it was no effort to eat it. If you’ve grown up eating it, it just seems the norm. I would have trouble now in getting through a plate of tripe, but what would give me even greater problems would be facing a pig’s trotter. This was a pig’s foot, pickled and somehow made into a jelly consistency, served by itself on a plate, and again, I think I remember eating them with lots of vinegar, which probably says something about the taste. But, even as a young boy, I ate them with no complaints or problems. Tripe today is an ingredient in pet food, and in many ways this is a pity, because it is very nutritious. We ate a reasonable amount of fish, there was a good fishmonger not very far up Ashton Old Rd, Tommy Torr’s. We also had a fair amount of shellfish. My dad would go to Manchester often on a Saturday afternoon, and it was rare that he didn’t come home with some shellfish, a whole crab, or some mussels, shrimps, sometimes whelks. The crab was fine, picking the meat out of a large claw was fun and tasty, and crab sandwiches were good. Mussels I avoided, but I think this had more to do with their appearance than taste, and I can eat them now and enjoy them. Whelks were awful. They had no taste that I could find, and they were as tough as old boots, the consistency was that of an eraser, and incredibly difficult to get rid of. An experience not to be repeated. We would have cockles occasionally, but I remember cockles mainly being sold in the pubs on a Friday and Saturday night. Sold in little water proof bags, with a shot of vinegar for taste. We had a lot of chips. A dedicated chip pan was full of lard, and was always on hand. I think we had chips with almost every meal-roast potatoes with the Sunday roast, but otherwise chips with almost everything. My mother used to do a variation, which was discs of potato dipped in batter and deep fried. She called them scallops, which caused me some confusion when I came across the fish a lot later. We ate a lot of animal fats in those days. This was before the medical profession started telling us that saturated fats were bad for us. Incorrectly as it turns out, and the advice is now changing. Lard and dripping were the norm in those days, and olive oil for cooking unheard of. The only olive oil we had was in the medicine cabinet, a little bottle for ear drops when we had a blocked ear. Our next door neighbour, Annie Griffiths, worked at Hugon’s, just over the canal bridge. Their business was producing blocks of lard, trade name Atora. Hugon’s was taken over by Rank Hovis McDougall, probably got into financial trouble when the advice changed to eating unsaturated fats. The only ready made food that I remember was fish and chips. There was a chippy near us, on the other side of the Old Rd, and we used it rarely enough that it was a real treat. Eating out was not common. There were cafes, of course for tea, cakes and lemonade, but outside of holidays, we never ate in “real” restaurants that I can remember. 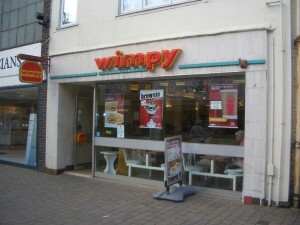 Fast food hadn’t arrived yet, so most restaurants would have been expensive, meat and two veg, cooked on the premises. 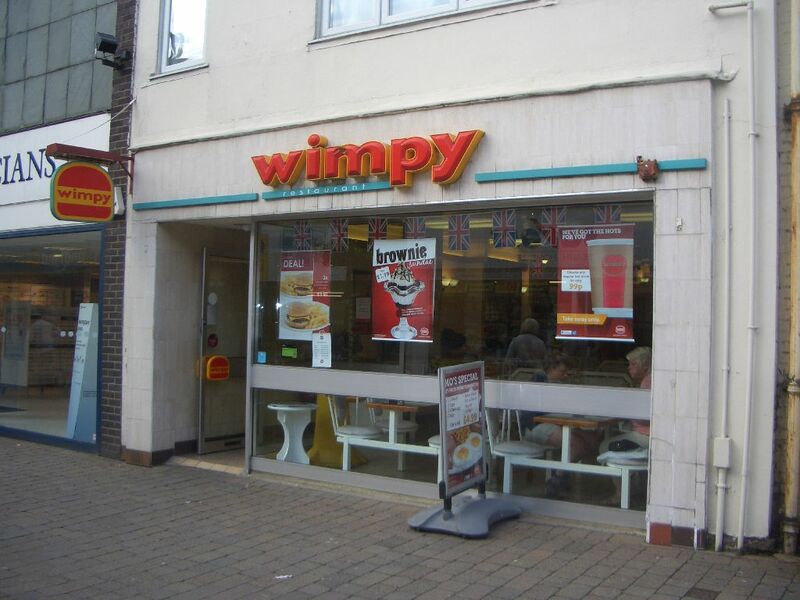 The first hamburger restaurants, the Wimpy bars, appeared in the mid- to late 1950s, I think, and seemed exotic, and amazingly affordable. Chinese restaurants appeared around the same time, mainly catering for the after-pub trade, a plate of chop suey went down very well after several pints. And if they were licensed, and most were, you could continue drinking after the pubs closed at 10.30. We also were introduced to espresso coffee, served in glass cups for heaven’s sake, in the new Italian coffee shops. A period of rapid change as the war and its aftermath was finally being put behind us. Finally, we used to eat far less sweets and snacks. Potato crisps came in small bags, and for flavour there was a small blue twist of paper inside with salt. That was it for flavour, salt. Sweets were rationed in the war and continued to be until 1953. Chocolate was rare in the war, I remember that railway stations often had a vending machine for Bournville chocolate bars, installed before the war, and always frustratingly empty. For us, the area that we now have around supermarket checkouts would have been an unimaginable Aladdin’s cave of sweets, chocolate, snacks and goodies. often difficult to know what you’re eating. Even if you do read the label, you’ll need a degree in food technology to know what it is and where it came from. You couldn’t say that about a pig’s trotter.